Not that I’m making excuses or anything. I just haven’t stepped foot in the kitchen. Until now. 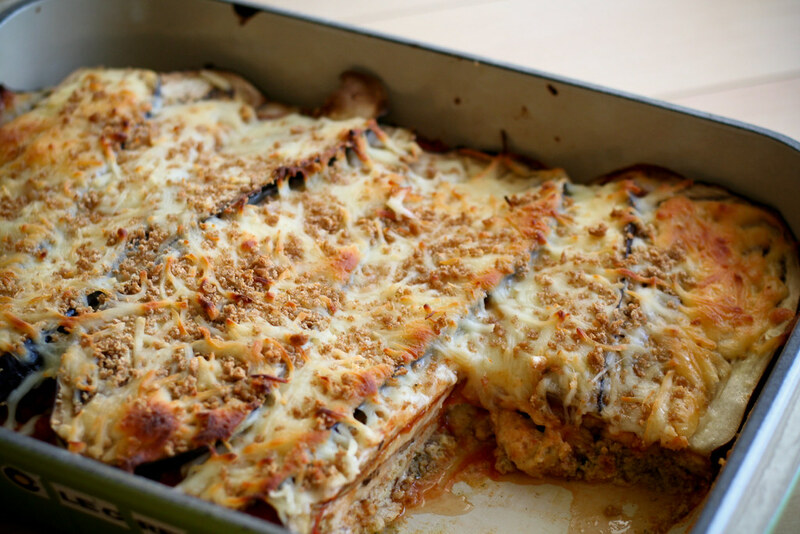 This Eggplant and Sausage Casserole is kind of a mutt itself – a mix between Eggplant Parmesan, pills Lasagna and Strata. It’s warm and cheesy and perfect for winter. The bottom layer is a kind of sausage bread pudding covered by a thin layer of eggplant. That’s topped with some marinara sauce, then more eggplant. As with any casserole, the crowning glory is a layer of shredded cheese and breadcrumbs. Pop in the oven until it smells delicious and dinner is ready. Honestly, I wasn’t expecting much from this recipe. Sure, I thought it would make a good weeknight meal, but I was surprised by how much I really liked it. It gave me a homey, pajamas on a Sunday afternoon kind of feeling. Like Chile, it’s highly recommended. Preheat your oven to 350°. Brown the sausage in a skillet, breaking up and large pieces. Toss the browned sausage with bread and place in a greased lasagna pan (mine is 9″ x 13″). In a medium bowl, whisk together the eggs, milk, salt, pepper and oregano. Drizzle evenly over the sausage and bread mixture. Add a layer of eggplant over the sausage mixture. Cover with all of the marinara sauce. Add an additional layer of eggplant. Cover the eggplant with mozzarella and breadcrumbs. 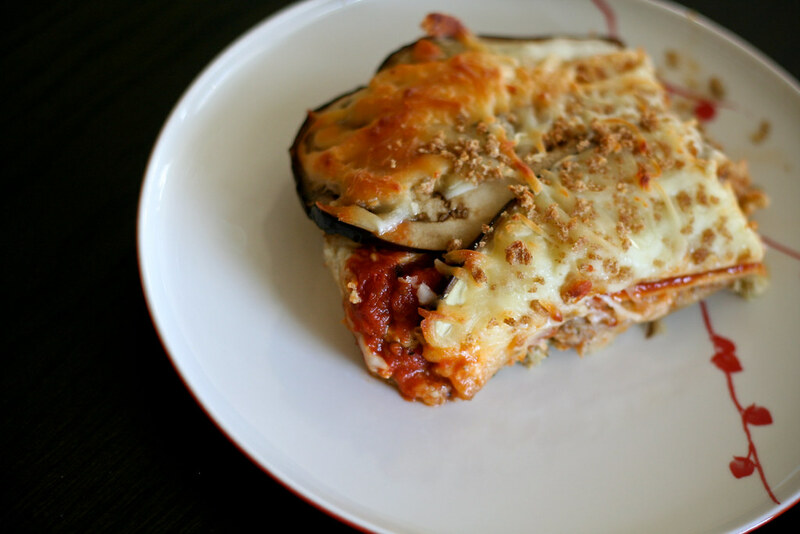 Bake for 45 minutes or until the eggplant is tender and the cheese is melted and browned. Makes about 6 servings (if accompanied by a large green salad). I’m glad you’re back – I love to see your recipes. And that’s a cute dog! Glad you are back in the kitchen, and feeling better….and that little Miss Mussels is the sweetest thing! Mussels is precious! 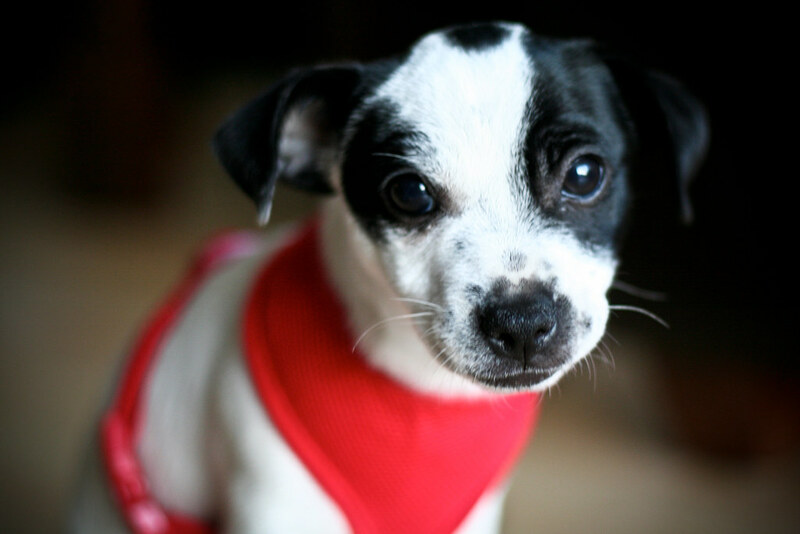 I am looking to adopt a similar mutt. I’m glad you’re back, love the recipes! Oh. My. GAWD! I want a big hunk of that casserole and some serious puppy kisses! I heart Mussels! I love the dish and I love Mussels the Mutt! What a serendipitous click off of foodgawker for me! Well-written. Thanks. I have been learning a lot about Asian cooking lately. There are a lot of creative recipes using rice out there, the trick is finding one that really brings out the flavor of the rice you are using. If you’d like to see my blog it’s here. Thanks again for this blog – it is really educational. I just made this and wasn’t a huge fan. It’s a little too hearty–heavy, starchy, etc. Your dog is adorable. Glad to hear you are feeling better and welcome back! Hey! Glad to know you came to Chile! I have been reading your blog for a couple of months… Love the recipes and ideas. I would love to hear about your trip to my country. I hope you had to time to try our food and visit some wineries. Found the eggplant interesting. Next time I would cut down on the amount of cubed bread and reverse the mozzerala and marinara sauce. Thanks! made this for my family…who, by the way, do not like sausage or eggplant….it was GONE!!!!!!!!!! I “oven fried” the eggplant first by egg washing, breading and baking drizzled with olive oil. The flavors were fantastic and even better the second day. Love the site and look for new recipes every week.